With the setbacks and vertical look to the building it doesn't have a hulking 15 story look to it. I think it would be a nice addition to the area. It's less bulky and imposing than the 7 story building next to L&B across the street. Yes, sure, some residents will complain about anything, anywhere. But I don’t think the city council would kowtow to residents who live west of France complaining about this building east of France. The council is too progressive for that. I think they do have a vision, and this is part of it. 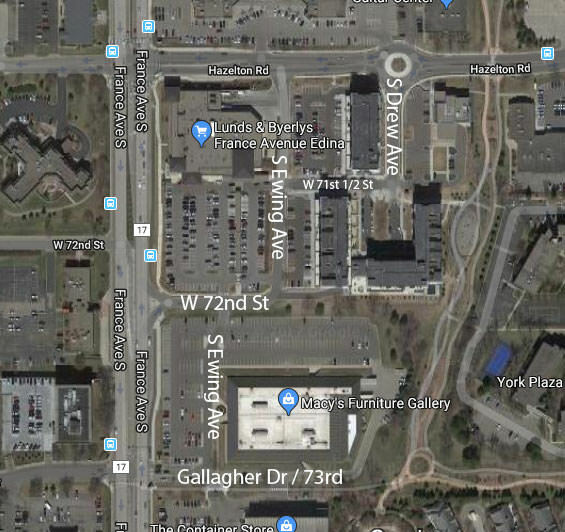 My concern is that the city’s Southdale area plan imagery is very urban, yet many of these new buildings are still kinda suburban—they’re not right along the sidewalk, nor connected. So you have this great density, but they end up not being very walkable. You still want to drive your car to get around. The destinations are too far apart to walk conveniently. I saw this also with the early ideas for the Southdale Library re-do. sdho wrote: One Southdale is like 12 or 13. One Southdale was proposed 12, and I believe was approved for 12, but revised and built to 10 instead. Better memory than mine -- you're right, 10. I'm not sure exactly where the lines fall, but in my opinion, buildings over 5 or 6 stories up to 25 or 30 stories just feel "tall". You stand next to One Southdale and look across the street at Westin and they both feel pretty similar from the ground -- even though Westin is nearly twice the height. Obviously design affects this. A 30 story building that's a perfect rectangle up in the sky may block out the light and feel more imposing. But as they tend to be built, it doesn't feel that different to me on the ground. I think twincitizen has quipped it before, but "drivable urbanism" seems to be a big underlying assumption of Southdale planning -- lots of density, decent design, but also lots of parking, no bike accommodations, limited walking options, and big setbacks. The Southdale Area Guidelines makes specific recommendations that are bizarre in light of urban goals -- like a 50' setback from the curb for development along France and York, including a 30' green space. If this were actually done consistently for the entire length of these streets, it could probably look kind of cool (although how do intersections work with a sidewalk 30' out of alignment?). But even looking at stuff only in the last five years, it is totally inconsistent. Onyx has a big surface parking lot out front, with car hoods blocking half the sidewalk. One Southdale has a green space that mimicks what the plan now says is good -- although it feels very suburban. The commercial spaces at 70th & France have more modest setbacks and a somewhat urban plaza. To-be-built Shake Shack has a bunch of ramps and the back of a mediocre little building. In light of what's actually getting built, their suggestion that they can create an Edina Champs Elysees with these excessive setbacks is comical. I think they should prohibit front parking, require customer (or resident) entrances with direct access to sidewalk, and set a max setback from back of sidewalk of 5 or 10'. However, the main way they are achieving this is through private driveways aligned to form de facto blocks. So why not work with developers to identify these in a cohesive grid using the names they line up with? Not as good as a true grid, but knowing that I'm at Drew at the roundabout (which you are -- almost exactly) is a good approximation for distance from France. There is a similar "easy" location for a name of Abbott/Beard that runs from 69th to Hazelton through Galleria and Target sites, and W 68th St through the Yorkdale Shoppes site. Now, finally, I'd like to understand why CSAH 31 is called York Ave from 66th to 76th when most of the route is Xerxes Avenue, and yet CSAH 31 actually runs on the Zenith Ave plane through the Southdale area. (ie, it is two blocks west of Xerxes) If they didn't care about the grid exactly and wanted a recognizable name, seems like Xerxes made more sense. If they did care, seems like they should have stuck with where it is and used Zenith. Was York just better-sounding than Zenith? Thanks, bapster. Sure doesn’t sound like mixed-use development, though. Strictly residential. I do like that the townhouses seem to face the Promenade and even have a walkway to them. But it’s one more non-destination on the Promenade. The Promenade could be so much more than what it is today (a linear park). sdho wrote: I think twincitizen has quipped it before, but "drivable urbanism" seems to be a big underlying assumption of Southdale planning -- lots of density, decent design, but also lots of parking, no bike accommodations, limited walking options, and big setbacks. In light of what's actually getting built, their suggestion that they can create an Edina Champs Elysees with these excessive setbacks is comical. The Champs-Elysees does have a 50-foot (or greater) setback, though, doesn’t it? Those sidewalks are huge. Now, whether Edina will ever have the density to support the need for such wide sidewalks is another question: I’ve read that the Champs-Elysees attracts 300,000 people a day. If they want it mostly greenspace instead of sidewalk, then that just continues the disconnected suburban feel and encourages high-speed car use. And, of course, the mayor of Paris has made the Champs-Elysees car-free one day a month. Let’s see us do that. As for “drivable urbanism”, ugh, that sounds very accurate. Well, accurate in terms of parking. In terms of biking & walking, the city has implemented (and has plans to implement) more biking & walking facilities. My concern, though, is that facilities—in the absence of *enjoyably* walkable/bikable *destinations*—is pointless. If traffic is moving too fast to feel safe for pedestrians & cyclists, if buildings are set back too far from the sidewalk or bike facility, if there is too much greenery separating destinations, and if there are single-use buildings (residential, etc.) that take up large spaces, then it won’t be convenient or enjoyable to walk or bike. So people will continue to drive. Anyone know if the JCPenney teardown / Lifetime Fitness construction will result in removal of the current parking deck there? I thought I'd seen that the Lifetime building was going to have a smaller footprint than the old JCP. Anyone got a link to a City Council agenda / site plans for the Lifetime proposal? Yeah I think if they did something truly like Champs-Elysses, more power to them. What makes that work (in my opinion anyway) is the consistency of trees, sidewalk space, and street walls. But that would take a really high level of commitment that would be hard to do -- actually creating a consistent build-to line, consistent height, etc. So far, the City doesn't even require or create consistent sidewalks or plantings. I think the safer bet is to do more conventional American urbanism with modest setbacks and a healthy (but not ridiculous) amount of space between sidewalk and curb. Although as a whole Edina has added a lot for biking, they have added almost nothing in the immediate Southdale area. They create some quarter-block-long bike lanes on 66th, 70th, and 76th to cross France. There is a short shoulder on Hazelton from France to the Promenade. And that's about it. They have done some sidewalk infill on France and York, but I'm still not convinced it's really moving the needle. For the most part, they wait for developments to come in and do a couple hundred feet of sidewalk at a time. But in terms of walkable-bikeable destinations -- it isn't as good as a traditional downtown, but for the most part the connections are pretty good. Even parking-lot-in-front Onyx has *five* different clear pedestrian routes from the sidewalk -- none are all that pleasant, but an impressive array of options. Aurora on France has traditional sidewalk frontage. Byerly's has their cafe door with direct access. The most disappointing recent addition was the Galleria annex, that technically has access from 69th, but you need to walk around three sides of this billboard wall thing. 15 story proposed residential tower proposed to replace Guitar Center on Hazelton, right on the Promenade. After the Estelle had a poor reception, I have no hope for this. It’s a pretty nice idea. If this goes through, how much longer will the underused USBank on France Ave last? France Ave seems to be a hard line for the small minority of residents of the area who are opposing all reasonable land uses on the west side. I don't think 15 stories east of France will be vigorously opposed. One Southdale is like 12 or 13. Throwing in my two cents. I really like that this development will have townhomes near the promenade. I love the idea of people being able to walk out of their houses and have easy access to a bike trail. I have walked down the Edina promenade several times, and I absolutely love the feel of it. twincitizen wrote: Anyone know if the JCPenney teardown / Lifetime Fitness construction will result in removal of the current parking deck there? I thought I'd seen that the Lifetime building was going to have a smaller footprint than the old JCP. I don’t know, but I wouldn’t be surprised if the JCP parking structure is planned for the under-construction hotel’s partial use. The Guitar Center replacement, called Hazelton Apartments, was presented as a sketch plan to the Planning Commission last night. It’s the same developer who did The Nic on Fifth. It was heartening to hear the developer say he thought that 1.5 parking spaces/unit was all that was needed, and is the upper limit for high-rises today. Several commissioners were skeptical, and thought he needed more parking, but they admitted the developer would have to live with the decision to have such a “low” parking ratio, so they were fine with it. Demolishion fencing going up around Southdale‘s JCP. What are they building in its place again? I mean the JC pennies spot? A Lifetime Fitness "lifestyle center"
Which looks sweeeet. If I weren't already a member at Alchemy across the street, I'd be all over this. I live in Richfield and used to have to drive out to the West End to get a fully stocked Lifetime experience. With Alchemy in, Lifetime under construction, and a barre studio planned in Southdale Square, seems like 66th & York/Xerxes could be the start of a little fitness agglomeration. Ah yes, the Regional Fitness Center, where everyone drives their car to destinations where they can be active.